What is the easiest way to identify a good Mexican restaurant? And by “good Mexican restaurant” I don’t mean some high-concept place that serves French-Mexican fusion tacos or a hipster place with deconstructed tacos served in mason jars. I mean the sort of place where you can get menudo any day of the week. The sort of place that makes me daydream about a month-long motorcycle tour through Mexico. There are a lot of good ways to identify these restaurants, but I’ve found the most reliable is looking for the Big Table. The Big Table always seats at least sixteen people; often more. It’s long and has a rotating group of people at it. In a busy restaurant at lunchtime, you’ll see construction workers covered in dust, doctors in scrubs, babies, hipsters wishing the tacos were deconstructed and served in mason jars, a lawyer or two, and so forth. When you sit at the Big Table you sit next to strangers or friends or people dining solo. You’ll hear multiple languages spoken. If you want to have a private conversation it’s fine; the din of you and twenty of your new friends provides enough background noise that you can have your private conversation in the middle of a crowd. Tonight I had to run a few errands before I ate. It was cold and windy. By the time I finished my errands I was chilled to the bone and ready for a good meal — perfect conditions for eating at a restaurant with a Big Table. For tonight it was El Paso right here in Iowa City. Unfortunately, as I entered one of the proprietors was busy putting the chairs up on the Big Table, indicating that that table was closed for the night. I came in right behind five or six guys who wound up splitting up between two tables. I took a third, and midway through my meal another duo showed up and took the fourth. That was it for small tables; if anyone else had shown up the owners would have had to reopen the Big Table. Still, for an out-of-the-way restaurant and store on a frontage road on a Thursday night it was a big crowd, especially given that there was only one cook on duty. But that one cook nailed it. We all lined up at the counter, he took our orders quickly and in two languages, and got to work. I ordered a couple of tacos de cabeza and a carne asada burrito. Within minutes I had my food. The other diners had all gotten much more elaborate meals, so some of them had to wait as long as ten minutes for their food. For the cook to go from an empty restaurant to having six meals on the tables in a matter of minutes was pretty impressive. I can’t vouch for the other patrons’ food, but mine was good. Left to right: two tacos de cabeza & one carne asada burrito. Cabeza is always good. Sometimes it’s great. The cabeza at El Paso tonight was excellent. Around here cabeza is usually almost shredded into very small pieces and strips. That’s the norm at El Paso as well, but tonight it was more in chunks than shreds. Look at all that cilantro! The chunks worked. El Paso’s cabeza was incredibly tender. It melted in my mouth. The flavor was just right. Every now and then cabeza tastes a little too strong for me; almost metallic. Tonight’s cabeza’s flavor was beefy without being overpowering. I wouldn’t change a thing about these tacos. I also enjoyed the burrito. Once the burritos are assembled at El Paso, they get grilled so they’re a little flattened and crispy on two sides. They also subscribe to the zone theory of burrito making. Rather than all the ingredients being thoroughly mixed like how they do it at Panchero’s, everything is separated. It gives you the opportunity to plan your bites strategically. This is a thinking person’s burrito. A dedicated reader recently made me a t-shirt to promote this blog. I need to start wearing it when I go on these trips so people realize I’m not some weirdo who takes close-up pictures of burritos for Instagram. I’m some weirdo who takes close-up pictures of burritos for WordPress. El Paso’s burritos are great. I enjoyed this one, but in the future might go for a meat other than carne asada. There is enough going on in a burrito like this that a mild meat’s flavor can get lost in the mix. I share part of the blame though, for liberally applying salsa to each level as I worked my way through the burrito. The ride tonight was more pragmatic than anything. 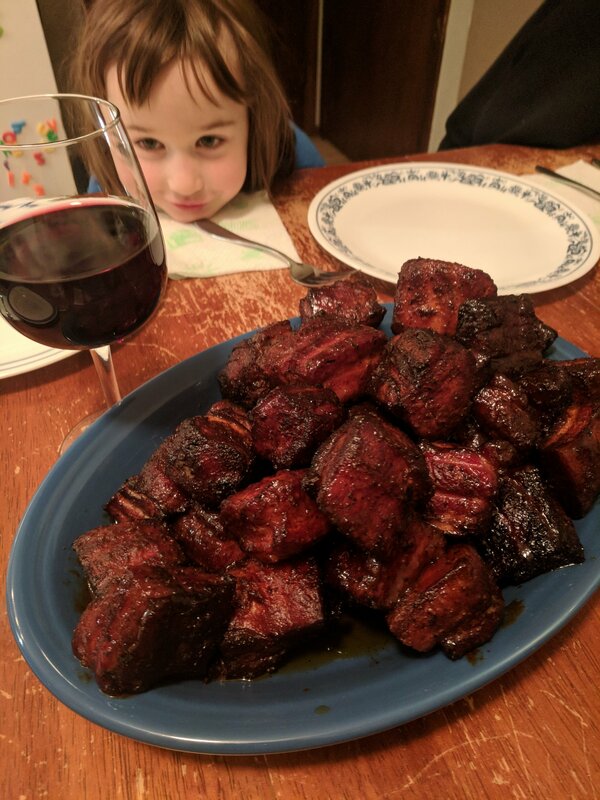 I was mainly looking to cover the most efficient route to the home brew store for grains and Costco for the pork belly that will become this on Saturday. Zooming up Highway 218 with occasional 35 mph gusts of crosswind is exciting, but not something I want to do every day. But, as I realize more and more every day, there’s nothing some tacos de cabeza can’t fix.